What vegans seem to have forgotten from their meat-and-cheese eating days is that food used to actually taste good. It was creamy or smoky and had different textures and tangs and made you want to watch cooking shows and fire up your barbecue and make reservations at fancy restaurants where they don't ask you if you want the bacon foam with caviar amuse-bouche, they just give it to you, and you eat it and say thank you sir may I have another. If I had a dollar for every vegan recipe I've read that touts the fabulousness of a certain brand of fake cheese that shall remain nameless, I would have maybe $30. Are you a vegan who loves Mexican food? these cookbooks want to know. Lucky for you there is this fake cheese that melts just like real cheese and tastes oh-so-yummy! These silly bastards either really believe that cheese tastes good or they have forgotten what real cheese tastes like. Upon the recommendation of a number of what I though were reliable sources, I bought this exact brand of cheese, ate it, realized it has the taste and texture of boogers, and threw the rest away. 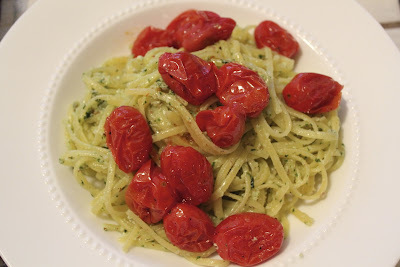 Almond pesto pasta with roasted tomatoes. I think this picture is deceiving. I think it looks yummy. The picture I saw online looked yummy. Usually when something passes the yummy picture test, it passes the yummy-in-my-mouth test as well. Let's read on. 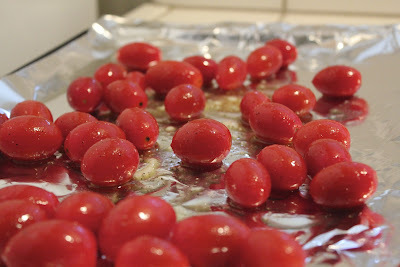 First I lathered some cherry tomatoes in olive oil, salt, and pepper, and roasted them. I usually enjoy roasting veggies in the oven, since they usually turn out pretty awesome. These could have been awesome of they'd been used in a different application, probably. As it turned out they were just way too sweet and didn't complement the dish at all. 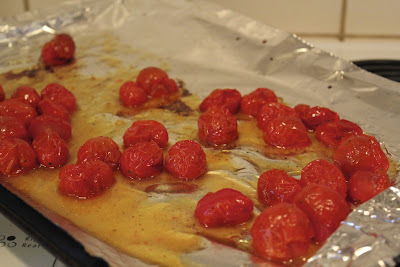 Sun dried tomatoes would have worked better. Here's how they looked when they were done cooking. Here are the ingredients for the pesto. 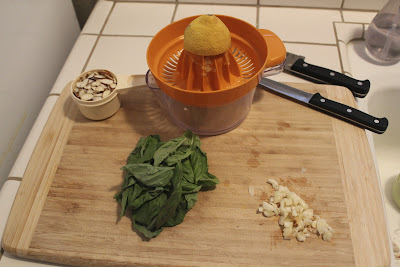 (not pictured: olive oil and salt) Almonds, basil, lemon juice, garlic. A normal pesto would use pine nuts and probably parmesan cheese. Some even use cream. Do you see where the vegans start to go downhill from here? 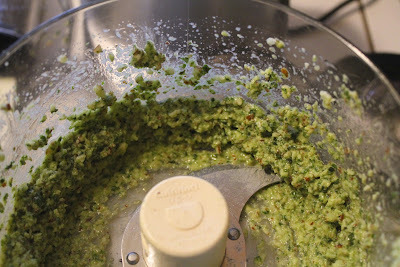 Here is what the pesto looked like. I guess I could have thinned it out with more olive oil. Overall it was way too garlicky and just didn't have that bite, that cheesy edge, that parmesan would have given it. The last day of the cleanse is Monday. I have a "cheat evening" coming up Saturday night, thank god. Wine, meat, cheese, chocolate: here I come. - More veggies and fruit are important, especially for your pooper. - Agave nectar is the bomb and should be used in place of sugar in many things. - I don't need that much meat, but I do need meat. - I don't need that much dairy, but I do need yogurt and cheese. - Too much dairy and sugar probably cause breakouts. My skin is clearer than it would normally be. - Exercise is an everyday necessity. This is the key to weight loss, hands down. - Fake cheese is the devil. - I need coffee in the mornings. - Two big glasses of water every morning are important for your pooper and hydration in general. - Twenty minutes of sun every day makes me happy. I hope one or more of those tips helps someone out there, other than me. I can't promise I'll never do another cleanse or another crazy diet. I battle my weight every day, so every new diet plan/book/video that comes out always intrigues me. If I can just keep a tight grip around some of my new habits, I think I'll be on the right track.